The answer is yes—with plenty of digital-age caveats—and it’s the thing that makes Gravity so frustrating even in its sometimes gasp-inducing set pieces. Because Cuarón now just can’t seem to resist the opportunity to turn his movies into showcases for “how did he do that” stunt camera work, like the single shot that swoops in and out of a moving car in his 2006 science-fiction yarn Children of Men. When revolutionary visual trickery is integrated seamlessly into a story, it can be part of what makes the movies magic; when it waves its arms and screams at you to pay attention to it, it can feel like the movie is starting to turn into a full-length teaser for a behind-the-scenes DVD featurette. 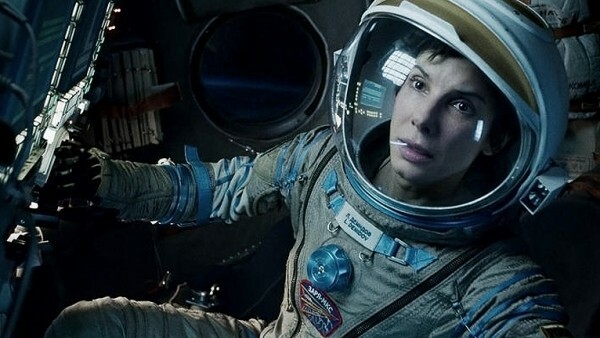 There’s still a load of excitement in the setup for Gravity that often pulls away from Cuarón’s attempts to overwhelm it. As Kowalski and Stone realize that their shuttle is beyond repair—with oxygen supplies in Stone’s suit running particularly low—they decide that their only hope is to use Kowalski’s jets to make their way to the relatively nearby International Space Station, and try to use one of its shuttles to make their way back to Earth. Thus begins a series of domino-effect crises: Will they have enough air and/or jet-pack life to make it to the station alive? Will they find a functioning shuttle when they get there? And is it possible that the chain reaction of satellite destruction will soon send another tornado of space junk in their general direction? Cuarón’s got a keen enough sense of suspense structure that the various dangers facing our heroes result in plenty of visceral thrills. Running on fumes as they make their way toward the space station, Kowalski and Stone find themselves spinning and grasping frantically for something to keep them from sailing out into open space once again. And when a tangled deployed parachute keeps the escape shuttle tethered to the station, we see the ship slinging madly through space like a paddleball, trying to avoid colliding with the main structure. This is effective, eye-popping stuff Cuarón’s serving up—and there’s rarely a moment when it’s not abundantly clear that he knows it. He makes magnificent use of the loss of equilibrium in zero-gravity environment, and there’s a momentum that keeps the tension high moment to moment. But such experiences generally work best when it’s possible to lose yourself in the plight of the characters—to forget, if only briefly, that you’re watching a movie. As long as Cuarón is determined to show off what he can do by slipping his camera perspective from outside Stone’s space suit helmet to inside for her point of view, you’re never going to get that moment of immersion. Gravity spends little time establishing its characters beyond the rudimentary knowledge that Kowalski is on His Last Mission Before RetirementÂ® and Stone has a tragedy in her past she’s trying to escape. It might have been better to leave out all backstory rather than including such perfunctory details, but the movie’s thrills aren’t diminished by its purely functional character arcs. It’s more indicative of Gravity’s problems that when Cuarón does want to give us emotion, he has Stone cry inside a zero-gravity environment, then pulls the focus forward to make sure we know he can create a 3-D, zero-G floating teardrop. Gravity is simply a fairly effective magic show, one where the magician never lets you forget that he can do all these magic tricks.